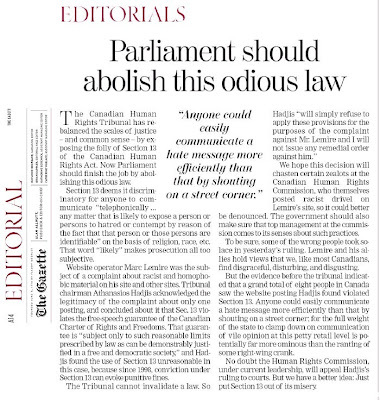 The Canadian Human Rights Tribunal has rebalanced the scales of justice - and common sense - by exposing the folly of Section 13 of the Canadian Human Rights Act. Now Parliament should finish the job by abolishing this odious law. Section 13 deems it discriminatory for anyone to communicate "telephonically ... any matter that is likely to expose a person or persons to hatred or contempt by reason of the fact that that person or those persons are identifiable" on the basis of religion, race, etc. That word "likely" makes prosecution all too subjective. Website operator Marc Lemire was the subject of a complaint about racist and homophobic material on his site and other sites. Tribunal chairman Athanasios Hadjis acknowledged the legitimacy of the complaint about only one posting, and concluded about it that Sec. 13 violates the free-speech guarantee of the Canadian Charter of Rights and Freedoms. That guarantee is "subject only to such reasonable limits prescribed by law as can be demonstrably justified in a free and democratic society," and Hadjis found the use of Section 13 unreasonable in this case, because since 1998, conviction under Section 13 can evoke punitive fines. The Tribunal cannot invalidate a law. So Hadjis "will simply refuse to apply these provisions for the purposes of the complaint against Mr. Lemire and I will not issue any remedial order against him." We hope this decision will chasten certain zealots at the Canadian Human Rights Commission, who themselves posted racist drivel on Lemire's site, so it could better be denounced. The government should also make sure that top management at the commission comes to its senses about such practices. But the evidence before the tribunal indicated that a grand total of eight people in Canada saw the website posting Hadjis found violated Section 13. Anyone could easily communicate a hate message more efficiently than that by shouting on a street corner; for the full weight of the state to clamp down on communication of vile opinion at this petty retail level is potentially far more ominous than the ranting of some right-wing crank. No doubt the Human Rights Commission, under current leadership, will appeal Hadjis's ruling to courts. But we have a better idea: Just put Section 13 out of its misery.